When searching for a long formal dress or floor-length evening gown, today’s confident woman can look and feel her best in a beautiful formal dress by Simply Dresses. Whether you want to be simply stunning or elegantly low-key, find the formal wear that’s just right for you in this collection of long evening gowns and formal dresses. If your style of formal wear includes a refined and understated look, browse classic cap-sleeve lace dresses and princess-cut v-neck jersey dresses. Prefer a bold and dramatic vibe for your formal prom dress or long evening gown? Try an open-back formal gown in a vibrant, rich jewel tone. Either way, Simply Dresses aims to please with this versatile assortment of formal dresses. When Should I Wear a Formal Dress? Chic high-low evening dresses and glamorous off-the-shoulder formal dresses are perfect for dress-to-impress events. Gleaming satin formal gowns or flowing long chiffon formal dresses are lovely for black-tie occasions. A-line formal dresses and fitted long lace dresses with a dash of beading are beautiful for country club venues or destination beach weddings. In this collection of evening gowns, find captivating formal dresses that will reflect your personality for every elegant occasion on your social calendar. Whether your style says “classic sophistication” or “relaxed and trendy,” here you can choose from gorgeous formal prom dresses and elegant evening gowns in a wide variety of colors, styles, and fabrics. From flattering a-line formal dresses and empire-waist dresses to flowing chiffon evening dresses and long mermaid gowns, find a glamorous evening dress that fits your figure as well as your style. In rich jewel tones, soft pastels, or warm neutral hues, the evening dresses in this selection are sure to offer just the right shade to suit you and the formality of your event. To combine comfort and style at your next black-tie event, choose from these evening dresses and formal dresses with cap sleeves, short sleeves, or long sleeves that provide chic coverage. Three-quarter-length bell sleeves, flutter sleeves, and elbow-length sleeves add a touch of vintage elegance to an evening dress. There are long evening gowns and formal dresses with exquisite sheer panels or feminine ruffled flounces that flatter and showcase your unique style. Love to shine in your formal wear, but glitz and flash aren’t your style? Browse the one-shoulder evening dresses and formal gowns with a dash of glitter or a sprinkling of sequins for just a hint of subtle sparkle. Feeling confident? 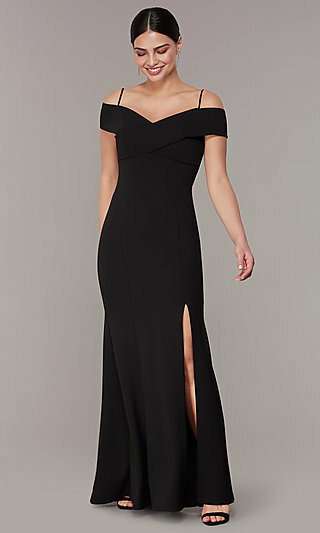 Spice up your formal evening look with a dress that has cut outs or an open back. Choose your next long evening gown from this assortment at Simply Dresses to look and feel fabulous while highlighting your style with natural, understated beauty or all-out glamour.